Great Scott is enthusiasm personified. 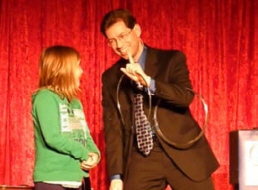 Your child will absolutely love the fun, funny and amazing magic show Scott brings to his or her birthday this year. Expect a great show from a full-time performer. "GREAT Scott, Just wanted to say thanks for a wonderful show on Sunday. Kids loved it! They won’t stop talking about your tricks and all the laughing they did. All the parents were asking where I found you as well! Good stuff. Thanks again." This year make it a trouble-free birthday party. Invite Scott to come and wow your child, his or her friends and all the parents as well! 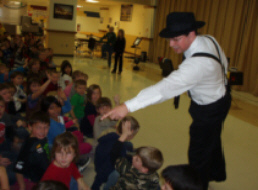 "The show was very fun and exciting for the kids and adults! I really enjoyed how kids were part of the show as assistants "
"Thank you! It was a great show! All the kids brought home [one of your] cards and were begging their parents to have you for their birthday." Great Scott has options to fit most budgets as well. Different length shows, balloon creations, and ready-made goody bags available. Weekends fill fast though. So, you'll want to call and find out what dates and times Great Scott has available. Great Scott is wonderful with kids. 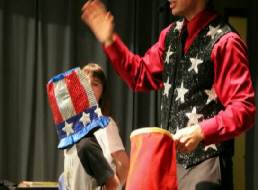 Primarily a magic show, Scott presents a silly, literally-laugh-out-loud program that will entertain all the children at your child care facility. Kids love him, AND they love his puppets. There's Max the Monkey, Charlie the Rabbit, Chauncey the Dog, Harry Scary Monster, Webster the Frog...to name a few. Depending on the show, the children will get a visit from one of these fun characters. There are specific shows for summer, harvest time, and winter. The children get involved from start to finish -- some as 'on stage' helpers, other right from their seats. But be assured that everyone will be entertained when Scott comes to visit. 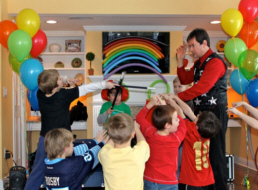 "We were very impressed at your ability to keep our children laughing and wanting more for an hour. You certainly are Great Scott in our opinion." 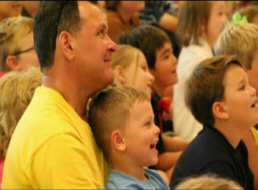 Scott has several School assembly programs to choose from. 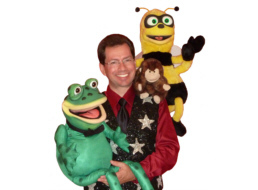 Each one is a combination of entertaining magic, puppets, and ventriloquism infused with an educational message. Topics covered are Geography, Character building, Reading a motivational reading program titled "The Magic of Dreaming Big". 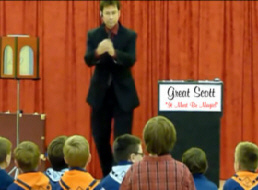 Visit Scott's school assembly page to read more about these shows. "I just wanted to take a moment and tell you what an amazing job you did at our school! 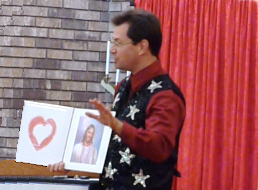 I received so many compliments on your show already from parents and kids alike. You were great to work with and fun for all! " 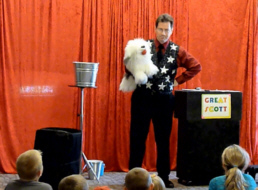 Great Scott the magician shines at libraries. 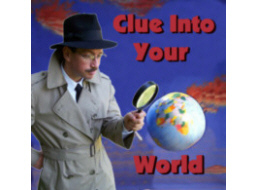 Each year he puts together an original program based upon the current year's SLRP (Summer Library Reading Program) theme. He's done shows about bees, fish, and bugs. He's taken the kids on a whirl-wind tour of the world. 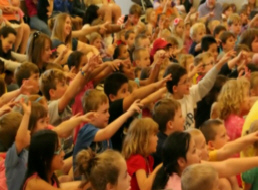 All the while, he is motivating kids (and parents) to read more books. 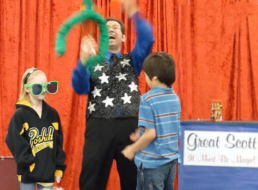 Shows are a combination of magic, music, puppets and lots of fun and laughter. 2014 is going to be a great show. Come along with Scott as he goes Book To The Future! 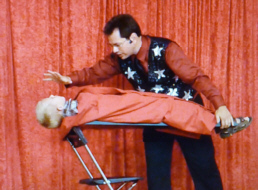 Magic, ventriloquism, science--its all there. But you have to invite him first. 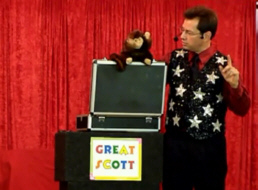 If your library is looking for a great performer and a wonderfully fun show this summer, give Great Scott a call now! "There were MANY positive comments after the show. Kids told me they had a good time, and parents said they thought it was great"
"Please ask him back - everyone RAVED about his performance!" Scott has the perfect show for your next Blue and Gold Banquet -- or any scout meeting for that matter. This program is fun for the entire family. However, the scouts play a major role in the 'on stage' assistant role. Get ready to be surprised, amazed, and laugh (literally) out loud. 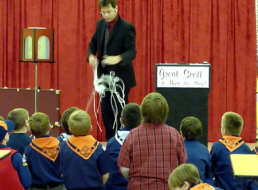 More than a magic show, this is a celebration of scouting. 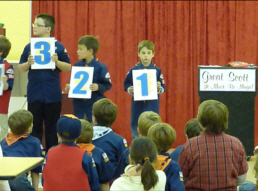 There's a game show featuring a half-dozen scouts, some crazy merit badge questions lots of laughter AND a surprise magical ending. 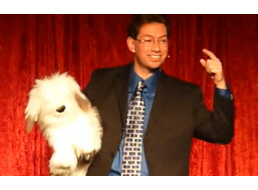 Plus you'll meet Chauncey (Scott's talking dog puppet) as he discovers what it means to "do your best". Adults and kids will love this show! "Everyone, from the parents to the children, were very pleased with the show that you put on Saturday night. We have never had the caliber of entertainment that you provided at one of our Blue and Gold banquets. As I was watching the show, I also was observing the adults and children and everyone was deeply engaged and truly entertained by your show. My kid's in particular really enjoyed "Chauncy". Several of the adults I spoke with later liked how you worked the cub scout theme into the act, especially the game show. . . You have a real talent and on behalf of Pack 3791, thank you for making our Blue and Gold Banquet a very special event." Scott loves to come and visit church's to present the Gospel or other Christ-centered messages to kids and adults alike. 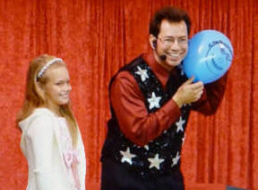 This is a fun show that uses magical illusions to entertain and encourage people in their faith. Great for Sunday school kickoff, or outreach events. Always Family Friendly, Always Good Clean Fun!